Dal system, Heimatar region. On the 6th of March at 11:35 EVE Standard Time, a battle unfolded over a neutral citadel leading to Siege Green. [SSGRN] and Did he say Jump [JMP-N] clashing. The war between Siege Green. and Lost Obsession [FATE] against Did he say Jump over the moons and planetary customs offices of the Heimatar region has been waging for close to a month, with Siege Green. and allies making significant gains. Did he say Jump struck back, reinforcing a slew of Siege Green. and Lost Obsession towers over valuable moons. With the timers set to expire around 11:00 EVE Standard Time on the 6th of March, both sides prepared for a major exchange. Did he say Jump had a joint Rattlesnake battleship fleet with Shadow Cartel [SHDWC] prepared with Minokawa force auxiliaries acting as its logistics wing while Siege Green. and Lost Obsession prepared a joint Machariel battleship fleet with combat carrier support and force auxiliaries of its own. The two fleets prepared to engage, however Did he say Jump\Shadow Cartel opted to take down a Lost Obsession tower outside the jump range of the alliance while allowing the other towers to safely exit their reinforcement mode and repair. Then after re-taking the moon, Did he say Jump\Shadow Cartel decided to bridge to a neutral citadel in the Dal system. The citadel had been reinforced by the alliance without being contested and was exiting its final invulnerability phase. This put the Did he say Jump\Shadow Cartel fleet squarely in the range of Siege Green.\Lost Obsession’s fleet. As the cynosural beacon lit up near the structure, Did he say Jump\Shadow Cartel’s Rattlesnake fleet jumped through and a second beacon blazed up near it. This signalled the Siege Green.\Lost Obsession fleet’s entrance. The two fleets met each other in point blank range and started the fight. A few of the Did he say Jump\Shadow Cartel Rattlesnakes were volleyed by the Machariels as their force auxiliaries were still setting up. Did he say Jump and Shadow Cartel retaliated, bringing in their own capital squadron. The capital ships, a mix of dreadnoughts with a few combat carriers embedded with them, had remained logged off so as not to get scouted by Siege Green. and Lost Obsession. Undetected, the ships’ pilots logged in and joined the fleet before jumping into the fray. 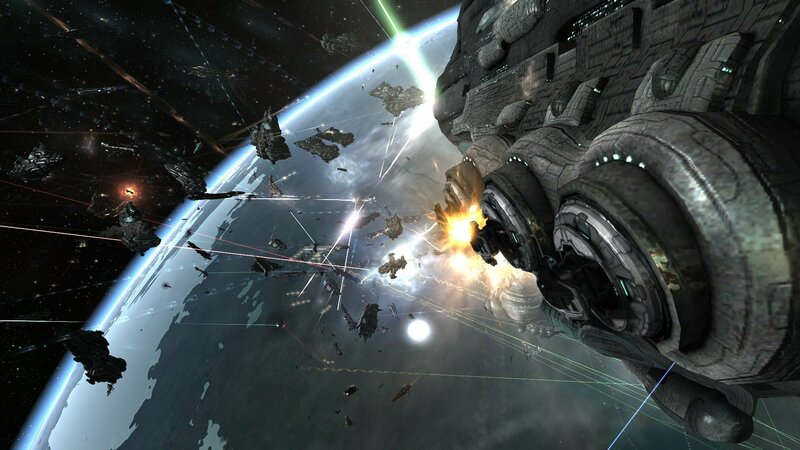 The dreadnoughts entered their siege cycles and targeted the Machariel fleet’s force auxiliaries. This put the Machariel fleet in a tight spot. It had dropped both its force auxiliaries and combat carriers in the middle of the battlefield. This meant the capital ships were in point blank range of the dreadnoughts who proceeded to annihilate them. In order to get away, the combat carriers started burning away from the fight while the entirety of the Machariel fleet concentrated its firepower on removing the dreadnoughts and thus saving its force auxiliaries. A bitter fight ensued as the two sides exchanged capital ships. Dreadnoughts were traded for force auxiliaries and combat carriers with each sides streaming more and more capital ships to replace the losses. In between a few sub capitals were destroyed, often as targets of opportunity. Regardless the race to remove damage from the field continued in full force. Yet as the battle wore on the Machariel fleet emerged as the victor. Did he say Jump and Shadow Cartel lost a fair number of dreadnoughts while the combat carriers managed to get to safety, moving beyond the optimal range of the dreadnoughts’ guns. Force auxiliaries continued to pour in for the Machariel fleet and with the reduced damage output of the Did he say Jump\Shadow Cartel’s fleet, managed to tank better and far longer. This gave the Machariel fleet the opportunity to take down more hostile ships. The Machariel fleet’s combat carrier squadron kept applying pressure on Did he say Jump\Shadow Cartel, using its fighter squadrons to chew through the dreadnoughts before directing its ire at the Did he say Jump\Shadow Cartel force auxiliaries. One after the other the force auxiliaries were brought down, forcing Did he say Jump\Shadow Cartel to bring more to the field or risk the destruction of its Rattlesnake fleet. Did he say Jump\Shadow Cartel’s combat carriers proved mostly useless at that stage of the fight as the Machariel fleet’s combat carriers managed to neuter them. The overwhelming amount of Siege Green.\Lost Obsession space superiority fighters made short work of the few fighter squadrons Did he say Jump\Shadow Cartel were able to field. At this point, Did he say Jump and Shadow Cartel attempted to extract their capital assets, using their Rattlesnake fleet to apply energy neutralizers in order to shut down heavy interdictors and other ships which were tackling the capitals. Without force auxiliaries though, the fleet proved vulnerable and the Rattlesnakes’ robust shields were easily overwhelmed. This led to a succession of losses for the Rattlesnake fleet as the last Did he say Jump\Shadow Cartel capitals were either destroyed or extracted. Once the majority of capitals made it off the field the Rattlesnake fleet disengaged as well, allowing Siege Green.\Lost Obsession to clear the field. With the Did he say Jump\Shadow Cartel fleet in retreat, Siege Green.\Lost Obsession extracted as well bringing an end to the fight. All told the battle 33 minutes with Time Dilation not reported and the system hosting 118 pilots at the peak of the fighting. Did he say Jump and Shadow Cartel lost a combined 29 ships including 10 dreadnoughts, 4 force auxiliaries, 1 combat carrier and 11 battleships for 48.3 billion ISK damage. Siege Green. and Lost Obsession lost 19 in comparison, including 4 force auxiliaries, 4 combat carriers and 6 battleships for a total of 22.81 billion ISK damage. Tags Dal Did he say jump Heimatar Lost Obsession Shadow Cartel Siege Green. I am pleased that I noticed this website, precisely the right info that I was looking for! . Howdy would you mind letting me know which webhost you’re using? I’ve loaded your blog in 3 different web browsers and I must say this blog loads a lot faster then most. Can you suggest a good web hosting provider at a fair price? Many thanks, I appreciate it! It?¦s really a cool and useful piece of info. I am glad that you shared this useful information with us. Please keep us up to date like this. Thank you for sharing. Thank you for the good writeup. It in truth was a amusement account it. Glance complex to more introduced agreeable from you! However, how could we be in contact? I need to gain a little extra money and also I am an extremely opinionated person so I seem like creating blog sites would certainly be a good beginning to making some added money. I am a full time university student and I additionally have a $20 hr a week work yet I am still having problems making ends satisfy. Many thanks for any kind of help!. Hi, Neat post. There’s a problem with your website in web explorer, would check this¡K IE nonetheless is the market chief and a big section of folks will omit your fantastic writing due to this problem. Hello very cool blog!! Man .. Excellent .. Superb .. I’ll bookmark your blog and take the feeds additionally¡KI’m happy to search out a lot of useful info here in the submit, we want work out more techniques in this regard, thanks for sharing. . . . . . I wanted to write you the very little observation to say thanks a lot as before for the extraordinary information you’ve discussed on this page. It’s tremendously generous with you to make extensively exactly what many individuals could have sold as an ebook to earn some money for their own end, notably since you could have done it in the event you decided. These suggestions likewise served to become a great way to recognize that other individuals have similar dream much like my own to find out much more related to this problem. I’m sure there are lots of more enjoyable moments ahead for individuals who check out your blog post. ajHBc3 I will right away seize your rss as I can at find your e-mail subscription hyperlink or e-newsletter service. Do you ave any? Kindly let me know in order that I could subscribe. Thanks. Fantastic website. A lot of useful information here. I am sending it to some buddies ans also sharing in delicious. And obviously, thank you to your sweat!